This post summarizes our 12th Annual Holiday Gift Giving Guide. We hope this tradition has inspired you to give uncluttered presents this season and throughout the coming year. For more inspiration, visit our previous Gift Giving Guides: 2007, 2008, 2009, 2010, 2011, 2012, 2013, 2014, 2015, 2016, and 2017. 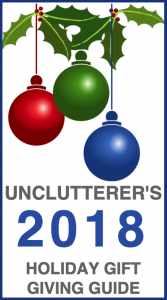 From the Unclutterer staff, we wish you a relaxing and clutter-free holiday season!